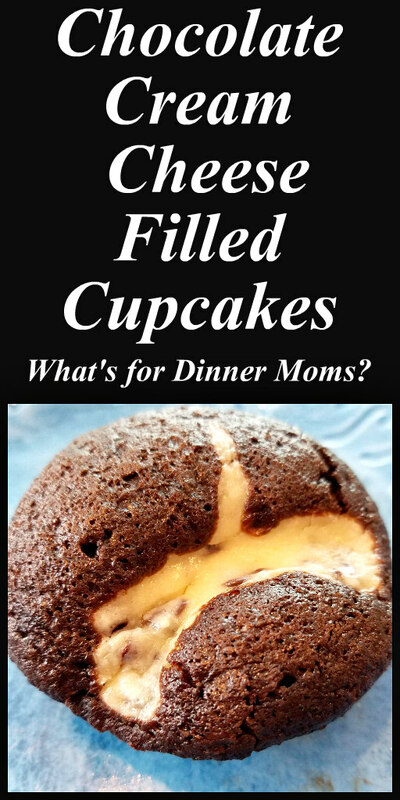 Week 5 Christmas Treats: Chocolate Cream Cheese Filled Cupcakes – What's for Dinner Moms? I really like making a treat a week. I thought this was going to be tough for me and it is, but it is also fun. I am going back and remembering things I used to make 20-25 years ago that I haven’t made in ages. The family is loving being taste testers too. Baking is tough because it has to be so precise but there can be a bit of experimentation too. I just have to remember to retain the overall ratios in the process. The bitter cold is the perfect time to stay in and bake. Yes, we have been under that big cold bubble. We have had 5 snow days over the past two weeks. My son is convinced that they are not going to have Spring break but they have enough snow days built-in and we have our vacation already scheduled. These were a hit! Both kids loved them without frosting but they are really good with a nice butter cream frosting too. It is entirely up to you whether to frost or not. 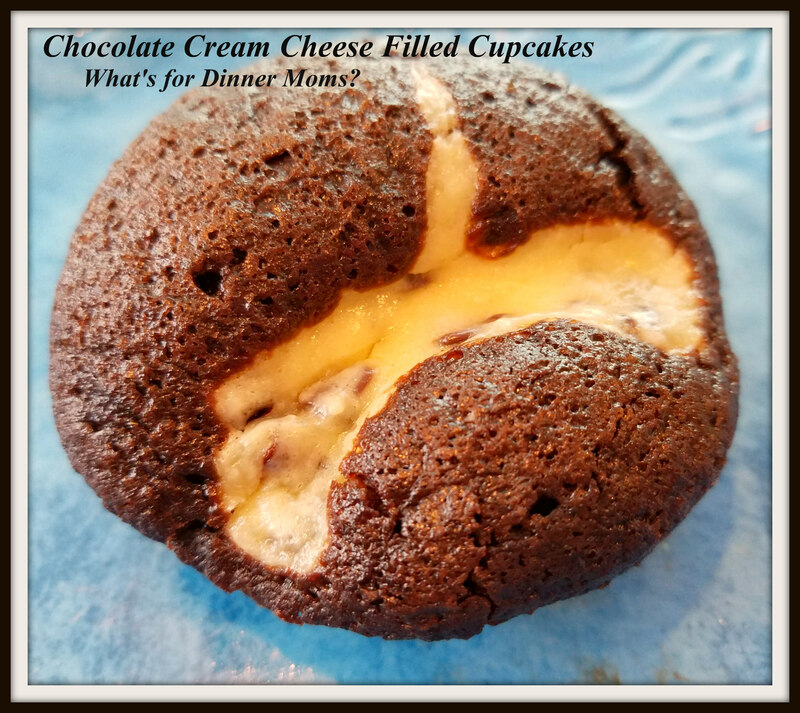 These are a nice chocolate cupcake with a light cheesecake like filling. Yummy! The filling is baked right in the cupcakes so you don’t need to scoop and fill them after they are baked. I like the ease of making them. A yummy chocolate cupcake with a cheesecake like filling. Preheat oven to 350. Place cupcake liners in a muffin tin or spray well with non-stick spray. In a large mixing bowl beat together the filling ingredients (except chocolate chips) until light and fluffy. Gently fold in the chocolate chips. In a second bowl, mix together flour, sugar, cocoa powder, baking soda, and salt. Make a well in the middle and add in the water, oil, vinegar, and vanilla extract. Mix together the dry with the wet ingredients until well combined. Fill muffin cups with 2/3 full of batter then spoon a tablespoon of filling into the center of each cupcake. Repeat until all batter and filling have been used. Next Post Nominations are Now Open! Yum. Chocolate and cream cheese is such a good combo. These look so nice, Marci. How cool is that! Will print it. Thank you for this recipe, Marci!